Out of the grey ominous skies a continuous series of squalls scudded across the horizon. At last a vague outline of Pitcairn Island appeared through the mist and haze. Under reduced canvas in the near gale force winds, we surfed past Bounty Bay and could see huge breakers bursting over the stone wall that usually protects the small landing area. It was quite obvious that no-one would be landing there today in such conditions. The poop deck became crowded as a familiar Pitcairnese voice answered our radio call and welcomed us to the island. The singsong lilt was difficult to understand for some at first, but by the end of our stay, most people could follow the island dialect. As expected, we were advised lo proceed to the anchorage of Ginger Valley, which was the only area vaguely in the lee in these conditions. Continuing on the radio, Jay the Magistrate told us that they were expecting one of the twice yearly supply ships that afternoon, and somehow in these dangerous conditions, they would have to launch the long boats from Bounty Bay to unload the ship or their long awaited supplies would be taken on to Panama. Whilst monitoring the radio, we learnt that the Blue Star container ship was battling headwinds - these same winds had given us a fast passage to Pitcairn in she previous few days. Their ETA off the island was not expected until late afternoon on Sunday 4 May. Early afternoon we sighted 2 of the aluminium long boats proceeding along the rugged coast after somehow being launched from Bounty Bay. (The islanders later told us it was the scariest launching in many a year). As the boats circled, those of us who had been here before scrutinised the long boat crews looking for familiar faces, and were surprised there was only 4 or 5. Verbal greetings were exchanged and one of the boats came alongside to allow the crew to jump aboard. We learnt that the unfamiliar faces belonged to the 'rat pile' who were on the island to implement a rat eradication programme, and their presence had more than doubled the able bodied population - the added manpower has been a great help during their stay. It soon became obvious as radio messages were passed between Pitcairn and the Blue Star ship that the Captain would only spend a limited number of hours off anchorage as he was already behind schedule. A plan of action was formulated by Jay in the hope of getting the bulk of the supplies off the ship. First priority would be the perishable cargo, and last on the list was the rat bait and petrol needed for the programme. All told there were 3 containers to be unloaded - a mammoth amount in a heaving sea. Their only hope to achieve this was to offload the non-perishables onto our deck, and this shuttle service continued well into the night. It was back breaking work as the boxes had to be thrown from the longboat to us as it was impossible for them to secure alongside. One and all helped in the process and the fore-deck and aft and the lower saloon soon disappeared beneath a mound of boxes, sacks of potatoes, and bags of rice. We even managed to find a space for a fridge and a TV that were for the Pastor. One long boat managed to get back to Bounty Bay with the frozen goods and to get in just as the light disappeared - much to the relief of the islanders. Even though the islanders/British Govt had paid Stg 10,000 for the ship to stop at Pitcairn, the Captain refused to stay any longer, so all the bait and petrol was not unloaded. However, the Assistant Governor who was visiting from New Zealand did manage to get off, and with the rest of the 'rat pile' on the one remaining boat, crashed on the few spaces they could find on our deck. 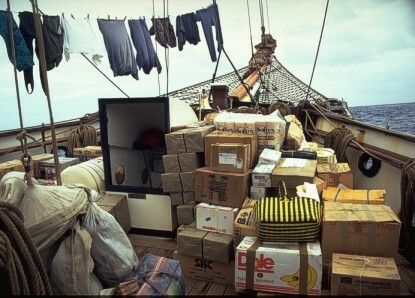 The back breaking process was repeated in reverse the next day when we had to reload the stores onto the long boats. Our voyage crew jumped aboard 'Tub' for the rough ride to the landing. 'Tub' sat at the entrance with the coxwain studying the pattern of the unrelenting waves. At a given signal the engine was given full ahead, and the longboat surged in the surf to round the small protecting breakwater. Once abeam of the landing steps full astern was given to bring her to an abrupt halt. As she strained on her lines in the surge, many hands were there to help get people ashore and unload vital stores. At times people were up to their knees in swirling water as huge waves broke over the wall and everyone scurried back and forth carrying the heavy boxes. Amazingly, nothing was really lost although some of the tins were dented and the boxes sodden. After all the effort involved by the voyage crew, shopping for food at home would always be exceptionally tame in comparison. The longboats were hauled up into the sheds where they are always kept, high above the turbulent water. 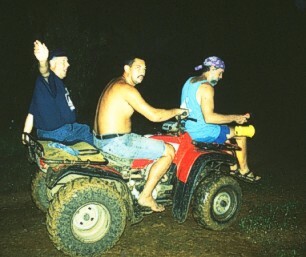 Then in the traditional Pitcairn way, families nominated how many of our crew they could accommodate - these bedraggled souls were then carried up the hill of Despair on the 4 wheeler bikes and taken to their new homes. A very social 10 days followed, during which time we were able to partake in 3 public dinners - one put on by the visiting Assistant Governor (the islanders always enjoy these as the Governor brings lamb and ice cream from New Zealand especially for the occasion), a Mothers Day service at the Church followed by a community lunch, and a sport's day followed by a public dinner at the sports ground. Thankfully we had mixed teams at the sports afternoon, as with plenty of chance to practice, the Pitcairners are mean volleyball players. They also had a slight weight advantage at the tug of war, but we managed to hold our own by surging the rope as if hauling up the mainsail, and these unexpected tactics caught them off guard - much to our surprise as well. These public occasions are always well attended, and there are always mountains of 'wreckle' (food) cooked by each family and brought along to the gatherings. Joanne, who is a dental technician had a busy week attending to all the islander's teeth, and the generator was going all day to power the rather antiquated drill. The surgery is now located in a newly built medical centre which is a huge improvement on the old facilities. Kay also did some medical rounds and assisted the island nurse with a few cases. Our people climbed to see the spectacular view at the Ship's Landing Point, saw Christian's Cave, went swimming in the crystal clear pool at St Paul's, and roamed all over the island, as well as managing to fit in the endless social calls where one was always plied with succulent local fruits and beverages - it was hard to pass a home without an invitation being extended. Many bought Pitcairn stamps and there was a brisk trade in Pandanus baskets and carvings. Diving and snorkelling expeditions were organised to see the last remains of the 'Bounty' and another sailing vessel the 'Cornwallies' which in 1875 drifted ashore whilst its master was visiting the island. For those not so adventurous underwater, the 'Bounty Bible' was open for display, as well as artefacts and memorabilia at the museum. Emma was lucky she missed out on school as there is always 2 weeks holiday after a supply ship visits. She had a great time however with all the kids, and like the rest of us, was sorry when the lime came to leave. We were laden down with fresh fruit, eggs, vegetables, homemade bread and bread sticks. As is the tradition - the islanders sang their farewell some 'In the Sweet Bye and Bye', and as the harmony drifted over the water, there were a few teary eyes among us all. Since our visit we have been saddened to read of bad press they have received in the British papers. From reading the article it is a very biased representation of their life and the struggle they have to survive, both physically and mentally. In our experience, they are the most generous hearted people and community one could ever encounter. I'm sure that all of us who were aboard for this memorable visit wish them well for the future - not many of us would take 30 unknown souls into their homes and share their lives as fully and openly as the Pitcairners did. They are a unique community and will always remain a treasured destination. Whilst on our passage to the Marquesas we were lucky to sight Oeno Atoll which meant that on this voyage we had sailed past or visited every island in the group - Ducie, Henderson, Pitcairn and Oeno. From radio contact made with the Canadian schooner 'Yan Van Gent' we learnt of the sad ending of the raft 'Mata Rangi' which was the reed raft built on the shores of Easter Island. Apparently she was successfully launched with the help of several naval cutters, and fitted out in the naval harbour at Hanga Roa prior to her departure. Within 48 hours of leaving heavy seas and large swells were experienced, and the Chilean sail training vessel 'Esmerelda' came to their aid whilst she was on a passage to Sydney and Japan. As the conditions moderated 'Mata Rangi' continued her passage north-westward, but unfortunately only 4 days later they were hit by a violent front which resulted in the raft breaking up in a matter of hours. The crew were in the water for 2 days clinging to the remains before being rescued by an American yacht, who look them back to Easier Island. Sadly they had only covered 180 miles of their journey to Tahiti. In the early morning light the ragged volcanic plugs of Fatu Hiva provided us with a breathtaking spectacle. One could see how many early sailors and adventurers had fallen in love with the Marquesas group. Rain clouds swirled amongst the peaks and miniature rainbows appeared across bays and valleys. Fatu Hiva is the island where Thor Heyerdahl came to live in the 1930's. We trod the valleys which he wrote about and bathed beneath cascading waterfalls. We spent an enchanting 10 days in this group, which provided spectacular photographic opportunities with its never ending visual delights. Our course then took us through the 'Dangerous Archipelago' - the Tuamotu Group. 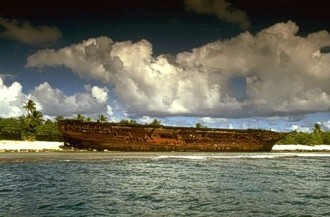 For one of our voyagers, Chris Roche, editor of the 'Cape Horn Magazine' Takaroa had a special interest - the remains of the 'County of Roxburgh ' which was a Glasgow built sailing ship which had ended her days on this remote atoll after what is supposedly one of the longest recorded drifts by an abandoned vessel. As we closed the island the rusting remains of a once proud sailing ship could be seen lying seaward on a palm fringed beach. Some of the crew went ashore to visit the wreck, whilst others had an exciting drift dive through the entrance into the lagoon. And some of the ladies had an even better time when then they met a Takaroan black pearl farmer who invited them into his home and gave each a handful of loose black pearls. At Rangiroa we were to share the anchorage once again with the schooner 'Alvei' and learnt of her adventures since our last meeting in Panama. Unfortunately strong south-westerly headwinds caused us to use the iron topsail for our final run into Tahiti, which was a shame considering all the good sailing we had had for our 100 days passage from Panama. Angela with her multi-lingual talents saved the day for us yet gain, and through her charming efforts, managed to clear us in and leave the way for some of the voyage crew to depart early the next morning. A final farewell dinner was held aboard that night, with the 'Order of the Golden Baggy Wrinkle' being awarded to Mickey Douglas in recognition of her efforts for producing the most baggy wrinkle above and beyond the normal call of duty. The week in Tahiti flew by as we restocked the ship and also had to schedule collecting a new Perkins engine, as our Operation Drake one finally gave up the ghost after nearly 18 years of good service. We had a wonderful lime eating French baguettes, and the Sunday market at dawn was up to its usual standard with myriads of exotic orchids, the aroma of fresh pastries and colourful cosmopolitan shoppers adding to the atmosphere. Days were spent in breathtaking anchorages m Moorea, Huahine, Raitea and finally Bora Bora. On our first evening in Bora Bora we heard the sound of drums drifting across the water. Chris Roche headed off to investigate, and eventually found one of the numerous groups in final rehearsal for the 14 July celebrations. On the nights we were there, everyone went ashore and were mesmerised by the amazing choreography, vitality and sounds of 60 or so dancers performed the tamaree and other local dances. It was a community affair, and even little girls of 2-3 mimicked the hip and hand movements of their older peers. No wonder Bligh's men never wanted to leave the natural beauty and rhythm of both the men and women dancers which was stunning. Our final visit in French Polynesia was to the atoll of Maupelia where the WW1 German Captain Von Luckner was to loose his vessel the 'Seeadler' on the reef when some freak waves carried her up. Von Luckner had converted an American sailing ship into an armed raider and played havoc in the North and South Atlantic and the Pacific, sinking numerous sailing ships and steamers - including the British sailing ship which he first went to sea on. Just the ribs remain of this historic vessel, but it still made a very interesting excursion. 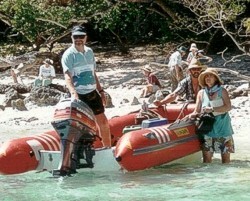 Trade winds carried us to Palmerston Atoll in the Cook Islands. This was our 4th visit to an atoll which is unique in many ways. Its founder, a Scotsman called William Masters first settled there with 3 Polynesian wives, and most people to this day have the surname 'Masters'. Like Pitcairn, their numbers have shrunk and only 40 or so people are left. 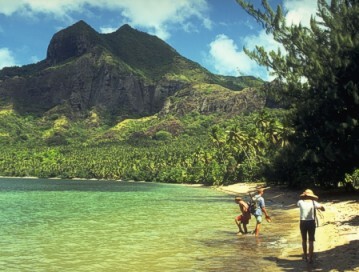 Their main income comes from coconuts which they harvest and selling parrot fish to Rarotonga. The islanders transported their fish on an ex Japanese long liner which they jointly owned with an American woman. She had previously owned the schooner 'Edna' (she was lost on a reef in the Cooks), and had shared the anchorage with us at Pitcairn in 1990. Unfortunately their transport vessel sank, and the crew spent 3 days in life-rafts before being rescued. Understandably this has seriously curtailed their income, especially when they found out that the insurance had not been paid. Ever westward, to the island of Niue where everyone had a great time exploring and snorkelling in the limestone caves which honeycombed the shore. One of our voyage crew had a special interest in visiting the island, as she had done research into the use of throwing stones as weapons by early man. Captain Cook and other early visitors to Niue recorded incidents where the Nuians used special shaped stones to ward off unwelcome intruders. He noted the accuracy and the severe injury caused by the natives using these stones as weapons. Unfortunately she could not find any examples of these stones left on the island, but the locals still have an accurate throwing arm, as we watched them play 'Niue cricket' - the main Saturday entertainment. The northern Tongan group of Vau Vau was a relaxing interlude before the hustle and bustle of Fiji. The cry was often heard 'thar she blows' a humpback whales frolicked in these calm waters. Everyone experienced the unusual beauty of being in Mariners Cave which has an underwater entrance and is a magical blue grotto. After a village feast numerous baskets and tapas made their way back to the ship. Suva lived up to its reputation of being on me wet side of the island - it rained almost solidly for 4 days. Between heavy down pours we managed to get the stores aboard and stowed, without getting everything too soggy. In desperation we departed for the southern Yusawa group, where we found sunshine and sandy beaches and many had their first experience of Kava. A blustery, close hauled passage took us to the island of Tanna in the Vanuatu group, which has one of the most accessible active volcanoes in the world. After a hair raising truck trip, one crosses the desolate ash plain and arrives at the base of Mt Yasaw. An upward 10 minute walk brings you to the rim of the crater, from where you can see the vent and watch molten lava and rocks being spewed into the air. It is especially spectacular as dusk falls, and the roar the volcano makes is unbelievable. For the next 6 weeks we enjoyed the delights and uniqueness of the Vanuatu islands. Although it has been 7 years since we were last there, the warmth and hospitality has not changed. Vanuatu provided some amazing diving, numerous shore excursions to custom villages, where the islanders live in the traditional manner of their forebears. Custom dances were performed in spectacular costumes incorporating body painting and we joined in traditional feasts and Kava ceremonies. Diving on the 'President Coolidge' was a highlight for many, and all enjoyed the ambience of Vila and Santo, which still retain a French flavour and cuisine. We had a busy time in Vila as we once again crossed paths with 'Søren Larsen' and we enjoyed an evening soiree in their company. Contact was also made with Bill Walker who was our engineer in the late '80's. and has since started an electrical and engineering company in Vila. We also managed to fit in Emma's 7th birthday party, and she had 7 friends for the party aboard, which included a treasure hunt and there were lots of bilious crew from all the ice-cream and pastries. Søren also contributed, and kindly sent over a tray of very delicious pink fairy cakes. The Banks Islands and Solomons were our next destination - a diver's delight with incredible drift dives and numerous pelargic fish. 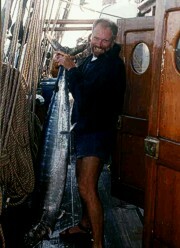 Eric Healey, the ex-Master of 'Asgard II'. joined us and acted as our local pilot, as he had skippered the Melensian Church's vessel 'Southern Cross' in these waters for quite a few years. It was incredible how often he was recognised by men whom as young boys, he and his vessel had conveyed from the small islands to the mission schools. We visited many of our old favourite haunts - the twin waterfalls. Jimmy Jones' island, Tikopea and the Reef Islands. Brisk trading in shells and artefacts ensued in each anchorage, and many treasured items were purchased. Ebony carvings inlaid with pearl shell are unique in this area, and some quite rare feather and shell money (which on some islands is still used to purchase brides) were obtained by some lucky voyagers. Making feather money is nearly a lost art form - it involves the capture (by using sap of a local tree) of a small humming bird whose red breast feathers are plucked before it is released. These tiny feathers are then laid, glued and woven into a local fibre, and slowly the feather money evolves. As you can imagine it is a very slow process, as the money is about 4 feet long when it is finished and no doubt is not an enjoyable experience for the birds. As we crossed the vast Pacific local people spoke of the effect of El Nino this year - Easter Island being so lush and green, and in French Polynesia we received a warning from the Nadi Met Bureau that the water temperature in June was higher than in 1983 when the islands experienced 5 cyclones. Even in June tropical depressions still ravaged areas of the South pacific, and already the first of this season's cyclones has struck the northern cooks. Fortunately for us, the weather was much cooler and due to the dry conditions, we hardly saw a mosquito, so malaria was not a great concern. However, all of Vanuatu, Solomons and PNG is in desperate need of rain and we were very thankful for the desalinator as there was no water available in the islands, the drought is taking its toll on the population with many deaths reported. The Louisades in south-eastern Papua New Guinea was our last experience of the true Pacific, where locals still trade in sailing canoes and encompass a traditional way of life. Enjoyable days were spent diving and swimming in the pristine waters which abound with fish life. Night excursions with the locals for crayfish gave us several succulent lunches, and it seemed that within a matter of minutes of trawling the line, a wahoo, king fish or tuna would be heading for the frying pan. We had forgotten just how wonderful these islands were and it was a fantastic ending to our Pacific crossing. Since our last newsletter, we have had some great sailing and both crew and voyage crew have said that the memories will remain with them for a long time to come. Ahead of us lies Cairns (and a culture shock) - our port of entry into Australia before the passage down the east cost to Sydney. Once again we will be spending Christmas in the sun, and it will be great to catch up with family and friends again after so many years away. We thank all of you who voyaged with us during the past 12 months and without your help and encouragement, the experience which the Eye of the Wind provides would not be possible. From ourselves and all the crew. we extend the Season's Greetings and wish you well for 1998.